As I talked about last week (Back to School for the High School Teacher Part 1: The Sanity Saver), I've spent a great deal of my summer hunting for ideas to make the school year go more smoothly. Today's topic is one I had thought about doing for a while but I had never quite pulled it together. One of the classes I took in high school taught me how to use Adobe DreamWeaver to create web pages, and it was something I absolutely loved. I've always loved the idea of having a classroom website but I didn't really know the best way to go about doing this. Using Google Sites, I've created a very simple template for a classroom website that can by used by the most inexperienced website creators, and I would like to share that with you today. First, here is a link to the website that shows the template. Feel free to explore! 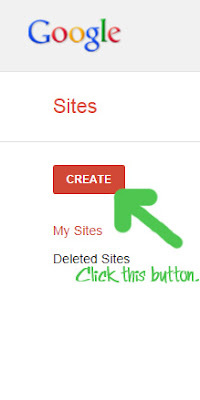 If you like what you see, here is the step-by-step procedure for making your own Google Site. Step 1: Go to www.sites.google.com. Step 2: Click on the red CREATE button (see picture below). Step 3: A page will come up asking you to choose a template for your site. Click the "Browse the gallery for more" link. 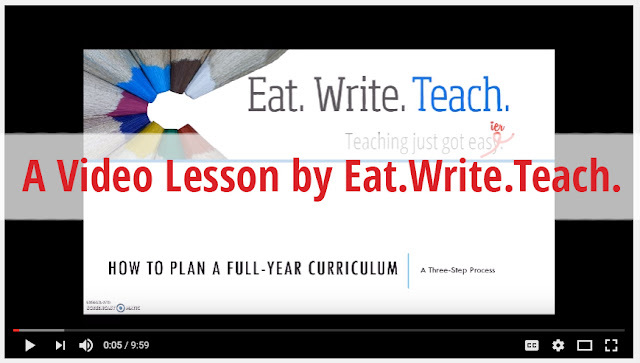 Step 4: In the Search box, type eatwriteteach. As of this posting, the only site template that will pop up is the one I created that you previewed earlier. 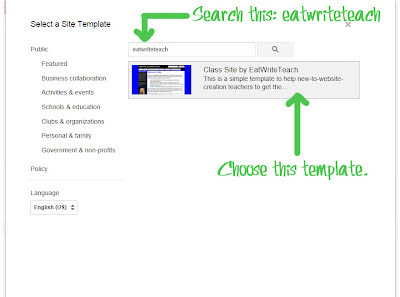 It should say "Class Site by EatWriteTeach." Click that template. It will let you preview. You can scroll down to choose the template. Step 5: After you choose the template, make sure you name your site and then scroll down to type in the little letter code to let Google know you aren't a robot. Then click CREATE. Congratulations! You have just created your classroom website! You can learn lots of things about the customization of your website by just playing around, but here are a few helpful hints. Click the pencil to edit elements of the current page. Don't forget to save! 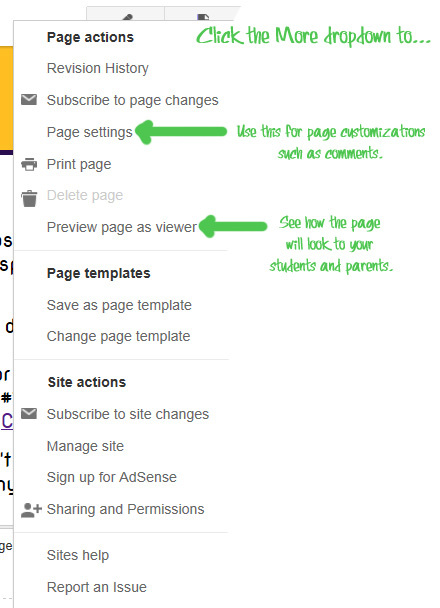 Click the page with the plus sign to add a new page to your website. The More dropdown is useful. 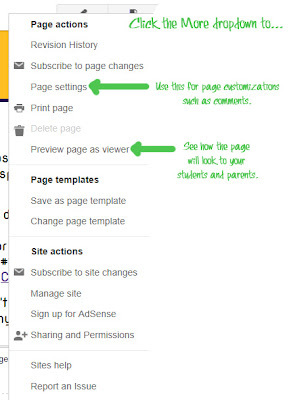 In particular, you will likely use Page Settings and Preview Page as Viewer to get started. Changing the title of the tabs is easy! Just changed the title of the page. Tune in Tuesday, August 7th for Back to School for the High School Teacher Part 3: The Well-Oiled Classroom Machine.